Dr. Mikhail Varshavski, better known as Doctor Mike, is based in New York City and recently partnered up with Dr. Jake Deutsch, the founding partner of CURE Urgent Care, to help get people to visit their doctor more often. Apparently, some people wait years to get even a basic check up. He says: “By partnering with Dr. Jake, my hope is to encourage more people to visit their doctor. We are both very active on social media and believe physicians need to become more relatable. 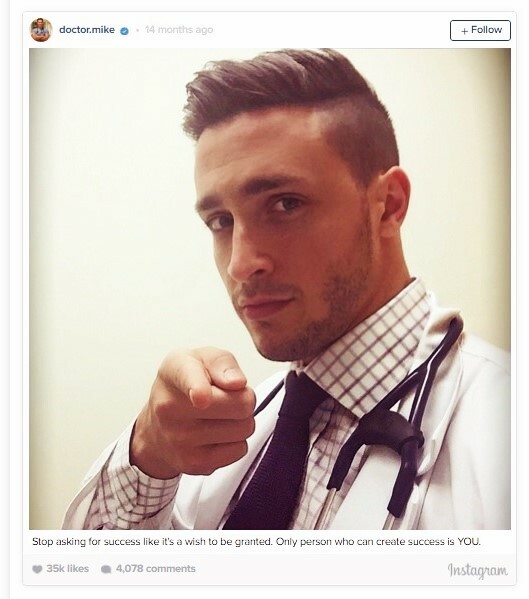 Together we want to break the antiquated notion that doctors are superiors who give order to their patients.” Glad he's trying to make a difference and posting on Instagram really helps make doctors seem more like the rest of us, albeit, he is genetically blessed (but, we won't hold that against him, will we? Ha).